At ChurchChairs4Less.com, we offer the highest quality church chairs, tablet arm chairs, folding chairs, tables, stack chairs and reception furniture at the best prices. Many of our products feature videos to give you more in depth descriptions and the virtual experience of touching, feeling and sitting on our chairs. We welcome your feedback about our site, products and your experience while shopping with Church Chairs 4 Less. Please use our Customer Service form to send a note. Absolutely We're glad to take your order by phone. Call us toll-free at 1-855-307-3862. Our friendly and knowledgeable customer service representatives are happy to help you place your order and answer all your questions. To place your order by mail or fax, simply download and print our official order form. Fill in your shipping and billing address, item details and your method of payment (credit card, check or money order). Orders shipping to destinations in the states of Georgia, Mississippi and Nevada will be subject to sales tax. Ensure that all charges, including sales tax and freight or shipping fees are included. Please contact Customer Service at 1-855-307-3862 to verify the total or if you're unsure of your state's sales tax rate. Please allow 5-7 days for mail transit time, based on the distance between your location and our headquarters in GA. You will receive a confirmation e-mail from us when we receive and process your order. Do you provide color/fabric samples? Yes we do! We know that colors viewed online may vary slightly from the actual color due to monitor settings, or that sometimes you might need to see the fabric before you purchase. If precise colors or fabrics are important to you, please submit your request for samples using our Customer Service form. Include your name, your address, product item number(s) and your color/fabric selections. Samples will be sent via USPS and should arrive within 5-7 business days. Will my item(s) require assembly? To minimize damage during transport, many items are shipped "Ready to Assemble". Instructions and all the hardware necessary, with the exception of wood glue, are included. We try to accommodate requests for changes or cancellations if at all possible, as your satisfaction is our priority. Please call us at 1-855-307-3862 or use our Customer Service form to cancel an order. Cancellation requests submitted after our regular business hours or over the weekend will be processed the next business day. In rare cases, when the cancellation is received after hours, orders may have already shipped. Orders that have already shipped will be subject to our Standard Return Policy . Our representative will confirm that your order has been cancelled via telephone or email. Orders are not cancelled until confirmed by our representatives. Orders for custom items cannot be cancelled or returned. We pride ourselves on delivering the best possible service. When you submit an order with us, we begin processing your order immediately. Most orders submitted before 2pm EST ship the same day. Because of how fast we process your order, we cannot guarantee cancellation or modifications once an order is submitted. Our goal is to provide you with the highest level of service and we thank you for your business! Orders shipping to destinations in the states listed below are subject to Sales Tax. If your organization is exempt from paying sales tax, please fax or email your exemption certificate/letter of exemption to us before placing your order. Proper documentation is required to be approved for sales tax exemption. By placing an order on churchchairs4less.com, you are agreeing that you have read and agree to our policies. All prices, specifications and availability on this web site are subject to change without notice. Although we make every effort to provide you the most accurate, up-to-date information, occasionally, one or more items on our web site may be inaccurately priced. In the event we receive an order with an incorrect price due to typographical, photographic, technical error or error in supplier pricing information, churchchairs4less.com shall have the right to cancel or refuse the order. Your payment will be processed when the order is received by us unless the item is backordered. The images you find on our website are as accurate a representation of the actual product as possible. Product images on your monitor/screen or printer can vary slightly in color from the actual product color for various reasons. Additionally, slight color variances sometimes occur between different production batches of product. Dye lot variations are common to the manufacturing process and within industry tolerances. They are not defects. Church Chairs 4 Less cannot be held responsible for supplying replacement product or issuing refunds for monitor/screen, printer or dye lot variances. Unless otherwise stated, our chairs have a maximum weight capacity of 225 lbs. 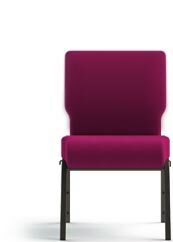 THIS SITE IS PROVIDED BY CHURCH CHAIRS 4 LESS ON AN "AS IS" AND "AS AVAILABLE" BASIS. CHURCH CHAIRS 4 LESS MAKES NO REPRESENTATIONS OR WARRANTIES OF ANY KIND, EXPRESS OR IMPLIED, AS TO THE OPERATION OF THE CHURCH CHAIRS 4 LESS SITES OR THE INFORMATION, CONTENT, MATERIALS, OR PRODUCTS INCLUDED ON THE CHURCH CHAIRS 4 LESS SITES. TO THE FULL EXTENT PERMISSIBLE BY APPLICABLE LAW, CHURCH CHAIRS 4 LESS DISCLAIMS ALL WARRANTIES, EXPRESS OR IMPLIED, INCLUDING, BUT NOT LIMITED TO, IMPLIED WARRANTIES OF MERCHANTABILITY AND FITNESS FOR A PARTICULAR PURPOSE. WITHOUT LIMITING THE FOREGOING, CHURCH CHAIRS 4 LESS DISCLAIMS ANY AND ALL WARRANTIES, EXPRESS OR IMPLIED, FOR ANY MERCHANDISE OFFERED ON THE CHURCH CHAIRS 4 LESS SITES. YOU ACKNOWLEDGE, BY YOUR USE OF THE CHURCH CHAIRS 4 LESS SITES THAT YOUR USE OF THE CHURCH CHAIRS 4 LESS SITES IS AT YOUR SOLE RISK. THIS DISCLAIMER DOES NOT APPLY TO ANY PRODUCT WARRANTY OFFERED BY THE MANUFACTURER OF THE ITEM. THIS DISCLAIMER CONSTITUTES AN ESSENTIAL PART OF THIS AGREEMENT. SOME STATES DO NOT ALLOW LIMITATIONS ON HOW LONG AN IMPLIED WARRANTY LASTS, SO THE FOREGOING LIMITATIONS MAY NOT APPLY TO YOU.